When applied to the brain, nuclear medicine techniques reveal critical information about the progression of the most devastating diseases, from Alzheimer's to traumatic brain injury. Such advances don't surprise Robert S. Miletich, MD, PhD, interim chair and professor of the Department of Nuclear Medicine at the Jacobs School of Medicine and Biomedical Sciences at the University at Buffalo, who is studying brain scans obtained from 16,000 patients. He says the wealth of information nuclear imaging techniques provide could pave the way toward a dramatic improvement in the clinical detection and treatment of many brain disorders. "I predict that nuclear neurology is going to become as important to neuroscience as nuclear cardiology has been to cardiology," he said. "The field of nuclear neurology, also called neuromolecular imaging, provides physiologic imaging of the brain and spinal cord," he explained. "By doing measurements on physiologic processes in all parts of the brain, we increase our diagnostic accuracy of brain disorders. Understanding these processes can also help us unravel the mystery of complex disorders from autism to Alzheimer's disease." Miletich, who is board-certified in nuclear medicine, uses these techniques to image disorders ranging from brain tumors, traumatic brain injury and epilepsy to transient ischemic attacks, various forms of dementia and movement disorders like Parkinson's as well as mental illnesses, including depression, anxiety disorders and schizophrenia. "The application of nuclear imaging to the diagnosis and treatment of heart disease led to a new standard of care for cardiology," said Miletich, noting that cardiologists now routinely use techniques like single photon emission computed tomography (SPECT), positron emission tomography (PET) and computed tomography (CT) for the early detection of structural and electrical defects in the heart. "Neuromolecular imaging with these techniques, as well as magnetic resonance imaging, can have as profound an effect on the management of brain disorders as they did on cardiology," he said. "A stroke is a very severe case of hypoperfusion," explained Miletich, "that's when brain cells die. What happens in Alzheimer's is chronic hypoperfusion, almost like a stroke in slow motion, where brain cells start to dwindle. It's a process mediated by abnormalities of very small blood vessels in the brain." "There are cases, such as in traumatic brain injury, where commonly used techniques, like CT and MRI show no abnormalities, but where a patient continues to be profoundly compromised in his or her daily life," he said. 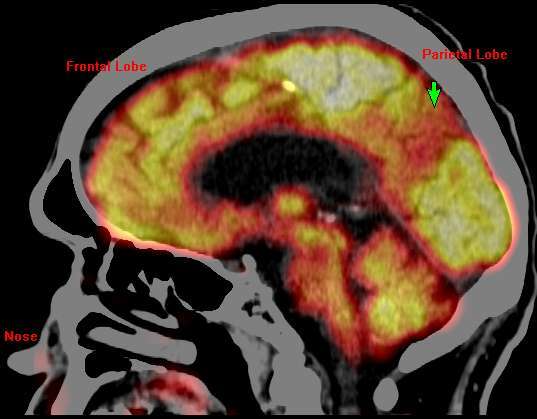 "In those cases, cerebral perfusion SPECT and glucose metabolism PET/CT can reveal exactly where in the brain the injury is located and the extent of damage to the brain. "When I image the brain with SPECT or PET/CT, I can see disorders long before they have fully developed. I can see Alzheimer's before the patient has dementia. This will facilitate the development of abortive therapy for Alzheimer's," said Miletich. Miletich next plans to present evidence in support of a new model of Alzheimer's that demonstrates it is caused by multiple factors. He is conducting research that relates vascular risk factors to small vessel disease, and small vessel disease to Alzheimer's disease. Said Miletich: "These are exciting times in the neurosciences."